Right: Bagua's "Close the Door and Push the Moon"
Making the Grab is essential when applying Chin Na and is only as effective as the defender’s use of the opponent’s energy and force. Initially, it must be natural and not overtly disruptive to the opponent’s actions. In this instance, Xingyi’s Metal Fist latches onto the opponent’s wrist, and slowly engages their spine in order to manipulate the opponent’s center, while Bagua’s Close the Door and Push the Moon neutralizes the opponent’s force by going along with the opponent’s momentum in order to apply a rear arm lock. Both styles employ similar concepts despite the dominate circular energy of Bagua and the linear progression of Xingyi. Nei Jia Kung Fu engages the opponent’s aggression with lightness and sensitivity, maintains contact, and exploits weaknesses in the opponent’s situation. We have combined two of our best stand alone Chi Kung instructional videos to create the Chi Kung Duo (Ancient vs. Modern). 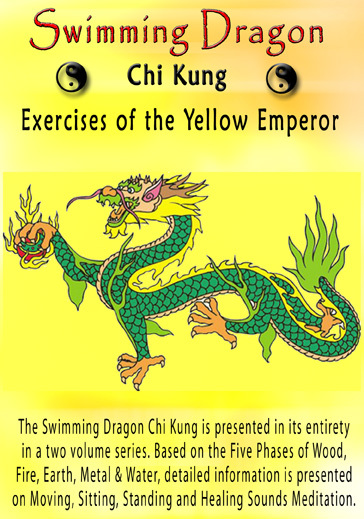 The Swimming Dragon Chi Kung, is thought to have originated with the Yellow Emperor, and, with one look at its shapes and simplicity of movements (based on the Five Elemental Phases) it's easy to conclude that this may very likely be something special that has survived the ages-not to mention the fact that some people swear by the wonders it does for their spine and posture. The Soaring Crane Chi Kung was created by Zhao Jin Xiang in the 1970s, and is one of the most popular forms of Chi Kung the world over. With its specific focus on therapeutic points, patience, and stillness in movement, it rivals the chi cultivation sets of the ancients. The unique "sixth section" (or, Advanced Meditation) is a marvel amongst any and all Chi Kung practices. While we don't advocate practicing two types of Chi Kung at the same time, these two popular and useful forms of Chi Kung practice, that we have combined in the "Chi Kung Duo" are certainly worth utilizing to compare, contrast, and ultimately cultivate.